WOW, that is smoking fast! I could not believe that speed, I wonder if it will get choked down later? I'm really impressed at how this site now just "Pops" into being, it was always a bit slow to load on the ADSL, and also I can now watch the streaming video of various races, that before the ADSL was so slow that I could not watch these great bike races, the video would stop and start so much. I can also look online for clothing and parts for my bike so much faster now, this upgrade in speed for my net service has really helped out my cycling hobby, I'm so very glad, almost like getting a custom frame built! I feel like I've gone to a very skinny high pressure slick tire on my computer now! Must make hosting that virtual private real-time render-farm so much easier. Render farm had me imaging large troughs of lard being slowly cooked, how boring to find out it's not that at all. Imagine people being able to buy virtual obese animals to extract oils from, COOL! 'cause at the top it says "General discussion about biking, bicycles, and all related topics". Does that comply with what it says at the top of the page now...? "General discussion about biking, bicycles, and all related topics". I'd say with speeds like that we both win! Extraordinary! Do you both live in houses? Hard to believe you are getting what I would have thought of as 'theoretical' speeds. I am in a danchi block, with 26 flats. I think my smokin' speed is 90. Used to be 2.7 on ADSL though! Stu--try a server close to wiggle and see what you can get. Will try to do the same tomorrow and Sunday (maybe a bit longer? ), and add some laps in the pool both days. 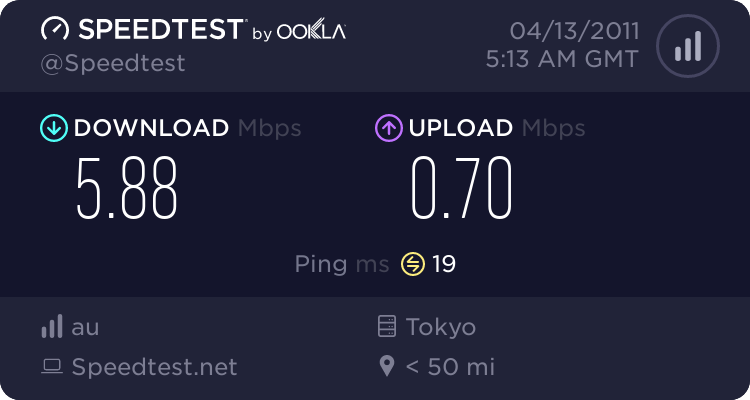 What are you all using your Internet connections, and computers for, that need such high speeds? I suspect you are all mainly doing the Browser / High-Tech Type-Writer / Home Cinema thing. Anyone doing anything other than this? Basically that, but we also chat with our 16 year old daughter who is going to school in Canada twice weekly via Skype, having a nice fast connection makes this much easier, less drops or frozen videos. He only posted a couple of times, then went his own way again. The guy `Tyson` was 64 when he started his training! Hope for all of us. I`ve been reading some of the thread cited, and on the plus side, matches the training protocols/ideas that I have been following. This is basically a thread about how I've increased my FTP from 140W to 315W. Tyson.